Hey there, I just received my Bead and Button Class Brochure in the mail. I love looking through that book, there are so many great classes being offered. It also reminded me I should announce some of the classes that I will be teaching this year. Before I give you the list of classes at Bead and Button, I will be teaching a two day workshop in Miami again this year. Last year this workshop was so much fun. I am sure this year will be just as much fun. They are a great group of beaders and I have added some new things to the class, including raku! Description: We are taking ceramic bead making to the next level to create vessels & rattles. Students will learn basic ceramic bead shapes as well as how to create hollow forms: vessels or rattles. For those who didn’t take the 2008 class, the focus will be on basic bead shapes. But, don’t worry, the 2008 class is not a prerequisite and the required kit includes all materials for bead making! In addition, all students will get an introduction to raku, with an opportunity to complete one pendant. You can see more information here at the South Florida Jewelry Arts Guild. There are several more this year because I know last year the first sold out so quickly, we wanted to make sure everyone could fit it in their schedule this year. I have a two day ceramic bead making workshop. Come learn the techniques of ceramic bead making from the author of “Ceramic Bead Jewelry.” In this fun class, you will learn everything you need to know about making, glazing, and firing your own ceramic beads. Students will learn how embedded wire is used for making components and findings as well as beads. Class will focus on making the basic shapes, links, components, hollow beads, and pendants. Different decorating techniques will be discussed. Past students have completed as many as 30-100 beads in class. This fun class is taught by the author of “Ceramic Bead Making.” The class will focus on the basics of ceramic bead and vessel making. 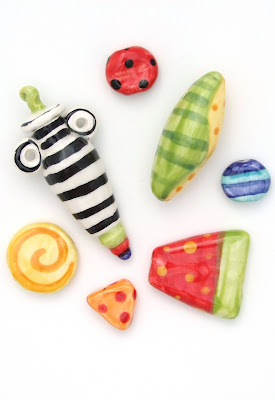 Learn to make basic ceramic bead shapes and pendants. Also learn vessel-making techniques for making rattle beads, miniature amphoras, and more. Learn to decorate the beads in class using underglazes and glazes. Come learn the technique of ceramic bead making in this class. This fun class is taught by the artist and author of “Ceramic Bead Making.” Students will learn to make basic bead shapes, pendants, and components. Students will decorate the beads in class using underglazes and glazes. Additional session offered Sunday, June 7 (B09325). Have a kiln but are afraid to use it? Thinking about buying a kiln and not sure which one to buy? This is the class for you. Many kilns can be used for ceramics, glass, and metal clay. Students will learn which kilns are best for each media. There will be demonstrations on loading and firing ceramic beads, glass fusing, and firing metal clay. We will go over sample firing schedules for all three medias. There will also be an extensive question-and-answer session, so students are encouraged to bring their kiln manuals to class. As always please e-mail me if you have any questions about the classes. I am always happy to help you choose the right class or answer questions about them. Registration for the Miami workshop is in progress right now. The Bead and Button Classes open on January 13th for registration.